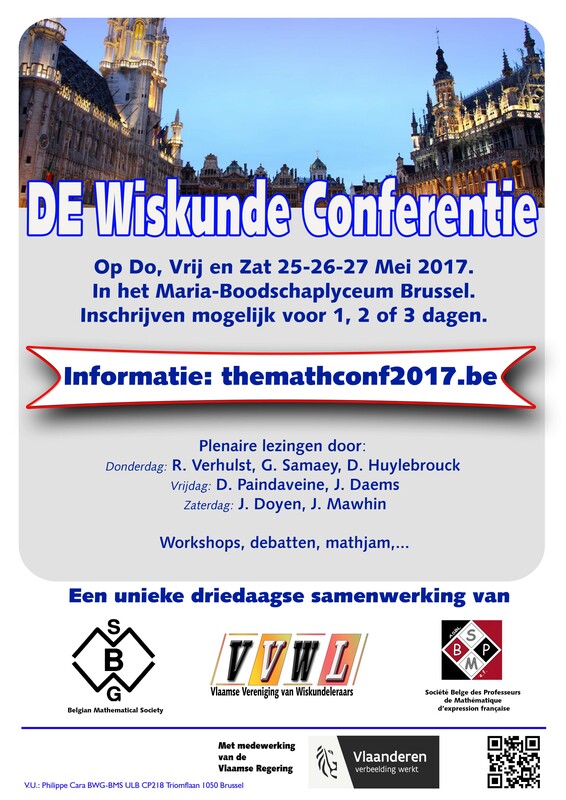 This BMS event will take place on 25, 26 and 27 May 2017 (this is the “long weekend” of the Ascension) and tries to revive the good relationship between mathematics teachers of all highschool levels and academic mathematicians. Now more than ever before there is a great shortage of mathematics teachers and mathematicians in general. This is a direct consequence of the low number of students enrolling in a mathematics curriculum at university and we would very much like to understand why this is the case. We think that not only universities but also teachers and all other mathematicians should try to bring a better perception of mathematics to pupils and society. That is why we decided to organise a joint conference with the teachers’ associations (VVWL and SBPMef). It is the perfect occasion to meet old friends and to strengthen contacts with colleagues. This three-day conference will have a variety of activities where each day is organised by one of the three societies. The general program of a day will contain two plenary lectures in the morning, workshops in the afternoon and a late afternoon activity. To encourage everyone to participate we have decided that the conference will be held in 3 languages: French, Dutch and English. Each day will have its main language. On the BMS day (Friday May 26th) we will invite the universities to present their activities aimed at high school teachers and pupils in order to attract more students. This will be both informative for us and for the highschool teachers. In the late afternoon we will organise a round table discussion around the role of maths teachers in education.